Humanoids are best chosen by expert players. Humans believe they know it all and are constantly jumping into situations unprepared. Humans start the game with less money. Flappers are ideal for beginner players. These flightless bird creatures were nearly wiped out of existence. Consequently Flapper parents are overprotective and send along extra money to start the game with. Welcome to Irata, brave colonist. After landing on the planet and dropping off Irata’s one and only ‘Colony Store / MULE Outfitter / Surveyor’s Post / Pub & Casino’, you’re ready to begin. 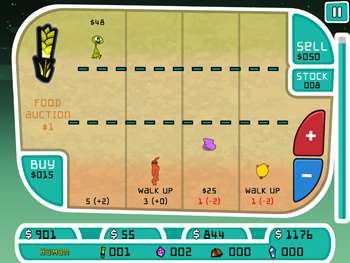 The 1st screen is a Score Summary which shows each player’s score and standing. Your score is comprised of your money, land and resources combined. This screen also displays the colony’s Community Health. Your goal is to finish Round 12 with the highest score and ideally with enough Community Health for the colony to survive. 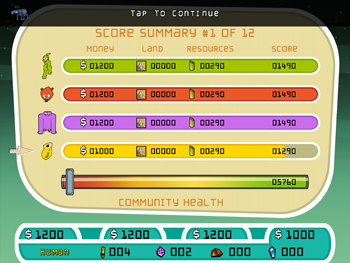 At the bottom is each player’s money and your own resource stockpiles (food, energy, smithore, crystite). You can view any player’s holdings on any screen by tapping on their tab. Behold, an aerial view of planet Irata. Breathtakingly bleak, isn’t it? Don’t worry, before too long solar panels, farms and mines will cover Irata from edge to edge. Irata is comprised of 3 different types of terrain. Each resource is ideally suited to only one type. Mountain (the bigger the better) = Smithore bonus. When the turn begins, each plot of land will be highlighted, starting with the top left corner and moving from left to right, row by row. When the plot you are interested in is highlighted, quickly tap it! 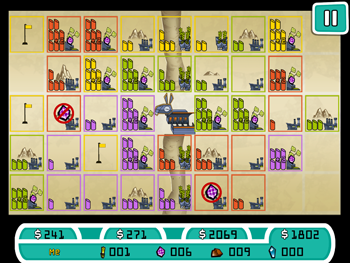 You only get one free plot per round so you want to be on your toes as other players may be aiming for the same plot. 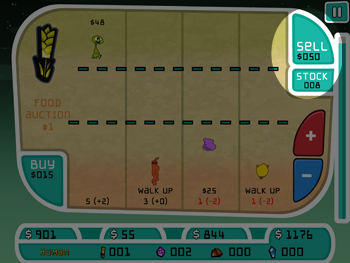 If two players attempt to grab the same plot, the player who taps first will win it. Grab a plot early to play it safe, or hold out for the juicier plots in the rows below. Don’t wait too long, however, or you may miss your chance and get stuck with a less than ideal plot. Also keep in mind choosing plots adjacent to those you already own grants bonuses to production. The river meanders vertically down the center of the map. With the Colony Store taking up the middle square, that means there are only 4 river plots in the game. River plots are ideal for food production. Hint: You want one! Lots of wide open space ideally suited for solar farms (i.e. Energy production) not to mention heat stroke. In addition to housing Irata’s only large indigenous species (the Wampus), mountains are ideal for mining Smithore, a valuable form of metal used to build MULEs. Larger mountain plots produce more Smithore and are often highly sought after. Note: Crystite (Tournament mode only): Crystite can be found in the Plains or Mountains. To determine where you should mine for Crystite you must first survey your plot of land as an action you can perform during the Land Development Phase. In addition, Crystite meteors sometimes strike the planet which is a very good indication of where Crystite can be found in large quantities. Which types of land should I choose? As with most things, ideally you want balance, at least to start. Food is required to give you enough time to complete actions during the Land Development phase. Energy is required for your MULEs to produce resources. Smithore is valuable and is required by the colony to manufacture MULEs. Crystite can make you very wealthy but is not without risk. Your needs will change as the game progresses. Perhaps bad luck wipes out all your food or the Colony Store has a fire and Food and Energy are scarce. The other players will also have changing needs and your ample food supply might suddenly be worth more than Smithore. Keep your wits about you and remember the game’s economy is all about supply and demand. After all players have selected their plots some players may be blessed (or cursed) with a random bit of good or bad news. Typically the winning players get bad news and the losing players good news (who said life was fair?). Random events can be anything from cash bonuses or penalties to bonus plots of land (or the loss of plot) and anything in between. If you are playing at the Standard or Tournament levels, you may be offered an additional plot of land at auction. Ok, you’ve got a plot of land or 2, now what? It’s time to meet your future MULE (Multiple Use Labor Element)! There’s a reason why the game was named after these temperamental beasts. MULEs are the key to all production on Irata. You must purchase a MULE, outfit it to your needs (Food, Energy, Smithore, Crystite) and then install it on your plot of land. Sounds easy, right? You’ll see… MULEs are expensive, they need to be lead around by the nose, they can run away or break down and they require energy to function. Love ‘em or hate ‘em, you need them! During the Land Development phase you will run around Irata performing various actions. You must complete these before the timer runs out. How much time you have is determined by your food storage so make sure you have enough or you can mess up your entire round. Luckily you begin the game with enough food in storage to perform a full turn. To guide your player, tap your destination or drag your character on the screen. All players take their turn simultaneously. You can’t really mess each other up so just ignore the other colonists as they go about their business. When the Land Development phase begins you will start in the Colony Store. There are eight different sections to the store, each with unique purposes. Let’s begin with the bottom right where you can purchase MULEs! This is the first and most important action you will want to take each round. The number of MULEs in stock will be listed to the lower right of the MULE stall as well as the price (listed on the floor of the stall itself). If MULE stock is low, prices go up. There’s nothing worse than not having enough funds to purchase a MULE to work your land. If you drag your character into the MULE stall, you will purchase a MULE which will proceed to follow you around. Don’t head for the exits just yet, your MULE is useless unless you outfit it to perform a specific task. The top four stalls in the store represent your MULE outfitting choices. From left to right we have Crystite (Tournament mode only), Smithore, Energy and Food. After buying your MULE, drag it into one of the outfitter stalls to outfit your MULE to work on that type of land. You probably already made this decision when choosing your plot of land in the last phase (river for food, plains for energy, mountains for smithore). For your first turn, you likely chose a river plot so it would be a good idea to outfit your MULE for Food production. Food impacts your time limit during the Plot Development phase. Not enough food and you won’t have time to outfit MULEs or catch the Wampus or gamble in the Pub or pretty much do anything. Energy is required for your MULEs to produce resources. No energy = no production. Smithore is potentially the most lucrative of resources and is a great way to get rich (assuming Pirates don’t raid the planet and steal it all). In addition, the colony’s Smithore stockpile directly impacts the price of MULEs. If there’s not a lot of Smithore in the colony, MULEs become very expensive and fewer are available for purchase. If you are unable to purchase a MULE, you can’t produce resources and you’ll end up spending a lot of time gambling your woes away in the pub. Crystite is not required by the colony for any purpose but rather is mined as a luxury resource for profit. It’s value is determined by the galactic market (versus supply and demand) and is therefore hard to predict. Once you have a MULE and have outfitted it, drag your character to the left or right exit to leave the store. We’ll cover the other store choices later. You’re now wandering Irata, trusty MULE in tow. Remember, time is of the essence so get that MULE over to your plot and set it to work. Drag your character to your plot of land and then tap the center of the plot to install your MULE. When you install your MULE you will see your resource icon. It will show you how good/bad the plot is for that resource by displaying 1-4 elements: Stalks for Food; Smokestacks for Smithore; Energy Panels for Energy; and Crystals for Crystite. You can pick up MULEs and move them to other empty plots or exchange them for MULEs on existing plots you own. 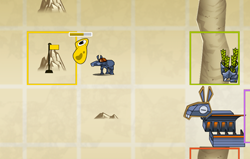 Drag your character to your plot, tap to pick up the MULE, drag the MULE to your destination and tap to place it. 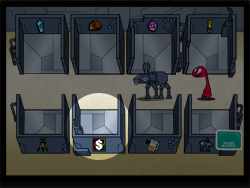 You may also pick up a MULE, return to the store and re-outfit the MULE to produce a different kind of resource. For example, food may become scarce in the colony and you may decide the best strategy is for you to outfit several of your plots to produce food instead of energy or smithore. To do this, pick up the MULE on your existing plot, return to the store (tap to enter), re-outfit your MULE to your new choice and then run back to your plot to re-install your MULE in its new role. Ah the Wampus. What settler hasn’t woken with a shudder after hearing that dreadful call? These large indigenous creatures live in the mountains of Irata, and can be seen (and heard) briefly as they appear randomly on various mountain plots. Can’t afford a MULE this around, catch the Wampus quickly and you may even have time to return to the store and purchase a MULE with your bounty money. Strapped for cash? Won an extra plot of land in a good news random event but would rather have the money? You can put up any of your plots for auction to the other players. Land is valuable, so do not make this decision lightly. To auction a plot of land, visit the Land Office in the store. It’s on the bottom row, second from the left with a large dollar sign. Run your character into the Land Office and you will be instructed to place a “For Sale” sign on the plot that you wish to sell. Run back to the plot and tap it to place the sign. The land will go up for auction on the next turn. Note: If there is a MULE installed on this plot it will be lost so you might consider moving it first. Crystite can be found on any plot in varying amounts. You could go with trial and error, or you can assay ANY plot (does not need to be one you own) to determine the amount present. Run your character into the Assayer’s Office and you will be given a device which scans for Crystite. The Assayer’s Office is located in the store, on the bottom row at the far left with a surveyor’s tripod for a sign. After visiting the office, install the device on any plot just as you would a MULE and you will be told the results. At least one plot will contain a lot of Crystite as will the plots surrounding it (to a lesser degree). If another player surveys a plot you will also see their results. Meteor strikes are another great indication of where to find Crystite. After all those potential actions you still have time left? Don’t wait out the clock, visit the pub! Visiting the pub ALWAYS ends your turn, no matter how much time you have left. On the plus side, you will always win money gambling (you are just that good)! The greater the amount of time left on the clock, the higher the amount you might win. To gamble at the pub, simply drag your character into the store (tap to enter) and then into the pub. The pub is located on the bottom row, second from the right with a large mug of beer sign. It’s time to sit back and watch all your hard work pay off (one hopes). The production phase is automatic and requires no player intervention. Simply watch your plots produce resource units and hope for the best! Type of land. As mentioned, river plots are better at producing food. Plains are better at producing energy. Mountains are better at producing Smithore. In addition, bigger mountains produce more Smithore than smaller mountains. Adjacent plots. If your plots are adjacent to each other, they each receive a bonus. Multiple same-resource plots. For every 3 plots of land that are all producing the same resource (no matter where they are located), you will receive an extra unit (on each plot). This bonus stacks with the bonus for being adjacent to other plots you own. Random Colony Events. Irata is an often hostile planet and many things can happen which impact production. Some events may be positive, such as sunspots which increase solar energy production. Others may have multiple effects such as acid rain storms which increase food but decrease energy. Many are negative including radiation bursts that cause your MULE to run away or pests that eat your crops or even Pirates that land on the planet and steal all Smithore (or Crystite in Tournament mode). Some events can have long reaching consequences beyond production. Pirates stealing all Smithore will drive the price of MULEs through the roof and limit their availability. Or perhaps the Colony Store catches fire, destroying all store goods. Better hope you made enough food and energy or that another player is willing to sell some because the store will have none for you to buy for at least a round and prices will inevitably go up in the Auction phase due to supply and demand. The auction phase is where the magic happens and you and the other players directly impact Irata’s economy. Buy low, sell high is the name of the game but much more can happen with bidding wars, withholding needed resources from the other players, buying out the store to create a monopoly, etc. Irata auctions are never dull and weapons are banned for good reason! Each auction begins with a Production Summary. There are 4 auctions in total. Food is always the first auction followed by Energy then Smithore and lastly Crystite (Tournament only). The Production Summary screen contains a lot of useful information which will help you determine your goals for the auction. Each player’s stats are shown so you have a better idea what your rivals have and what they might need. This last piece of information is what you should focus on. As a rule of thumb, if you have a surplus, sell! If you have a shortage, buy! Shortages in both food and energy have consequences (not enough food = less time during development. Not enough energy and your MULEs stop producing resources). If you have a surplus, you’ll likely want to consider selling. Food and Energy both have a shelf life. If you keep a large surplus, much of it will spoil (food more so than energy). Mind you, withholding your surplus from other players and letting it spoil intentionally might be your strategy. Also note that Smithore and Crystite do not spoil. Technically, every unit is a surplus since these resources are not consumed. Feel free to hoard as much as you want (which can backfire if the Pirates show up and steal it all). Also keep in mind if the Store is low on Smithore, MULE prices and availability will be impacted. Speaking of the Store. 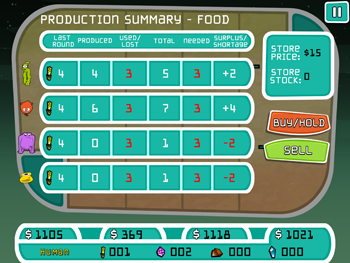 The Production Summary screen also displays what price the Store is willing to buy your resources for and how much stock the Store has. As mentioned above, this can be important if the colony has a shortage and the store is running out. To proceed, tap on either BUY/HOLD or SELL to proceed to the Auction as a buyer or seller. If you plan on doing nothing, tap BUY/HOLD. There’s a lot happening on the auction screen. 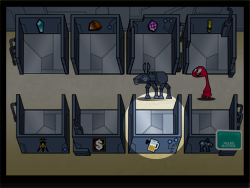 In the upper left is a large icon representing which resource is up for trade. In case you’re not sure what a giant stick of wheat is supposed to represent, written below is the title of the auction as well as what round the game is currently on. Hint! If it says Food Auction #12 (or #6 on Beginner), this is the FINAL food auction before the end of the game. Each player starts at either the top or bottom of the screen. Players at the top are SELLING, players at the bottom are BUYING. You chose this position on the Production Summary screen when you tapped either BUY/HOLD or SELL. The premise is simple. Buyers walk upwards, raising the asking price at which they are willing to buy as they go. 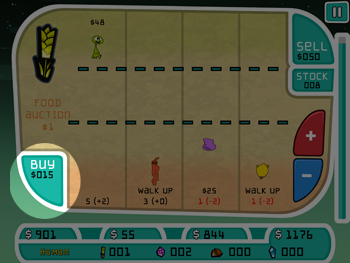 This price is represented as a dotted line which moves up with the player. The actual price is listed at the bottom of the player’s column (as well as how much of the resource you have and how much is surplus/shortage). Sellers walk downwards, lowering the selling price represented by their own dotted line. Again, the actual figure is displayed in the seller’s column (at the top). The large plus and minus buttons on the right are used for controlling your character. Tap and hold plus to move your character up. Tap and hold minus to move your character down. To summarize, the buyer who is highest sets the buy price line. The seller who is lowest sets the sell price line. How many units depends on how long you remain at the same level. You’ll want to pay attention, as units are exchanged quickly. When you reach your desired amount, disengage by walking back down (if you’re a buyer) or back up (if you’re a seller). Note: To safeguard your greedy selling habits, if you try to sell food or energy that you actually need (i.e. more than your surplus) you will automatically be disengaged and returned to your starting position. You can continue to sell by running back down again but you will be giving yourself a shortage. Hey, sometimes it’s worth going hungry if the price is right! Likewise, the store is always willing to sell you resources as long as it has some in stock. The store’s selling price is shown in the upper right corner where it says SELL. The store’s stock is also listed beneath the selling price. If you are buying and wish to purchase from the store, move your character up to the top until you reach the Store’s selling price and units will be exchanged. Keep this in mind. If you’re unwilling to buy or sell to a player, they can usually get what they need from the store so don’t wait too long. Note: If the store runs out of stock, there is NO maximum price and you can continue to run up indefinitely, driving your asking price higher and higher until (IF) another player decides to come down and meet you to sell their goods. 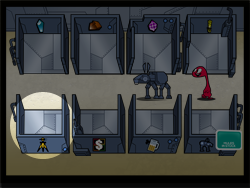 Creating a scenario where you have a lot of one resource, the other players needs it and the store has no stock is a dream auction scenario for a seller in MULE Returns. That’s it! Errr… did we mention there’s a time limit? The bar at the right represents how much time until the auction is over. If that wasn’t exciting enough, there’s a ticking sound which gets faster and faster as time runs out. 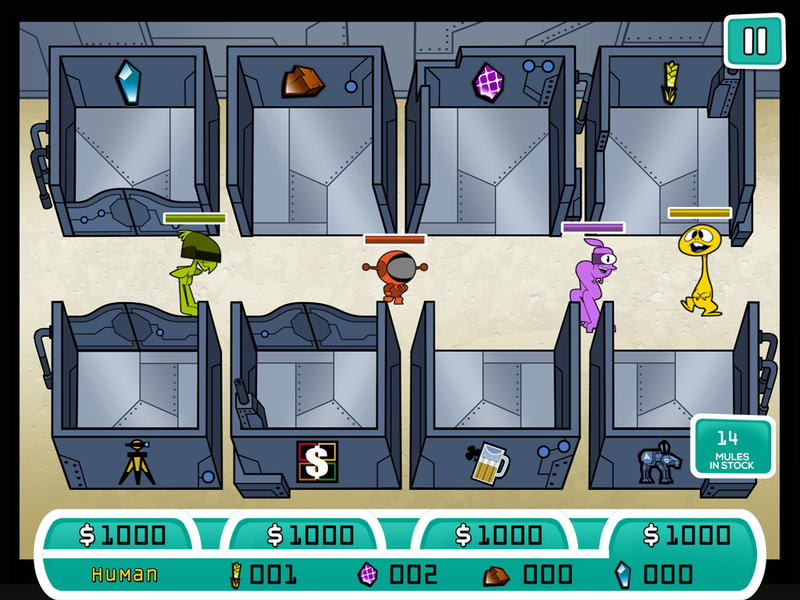 Once the time runs out, the auction is complete and the game proceeds to the next resource auction. Once all auctions are complete, the Score Summary is displayed so you can gloat at how much you are trouncing your neighbours (or hang your head in shame). Tap the screen to continue and Round 2 begins with Phase 1 starting again. Rinse and repeat for 12 rounds (6 for Beginner) and the game is over!